Diltiazem Dilemmas – Why So Many Diltiazems? Having worked in the retail pharmacy atmosphere for over 20 years, and having trained (or ruined?) 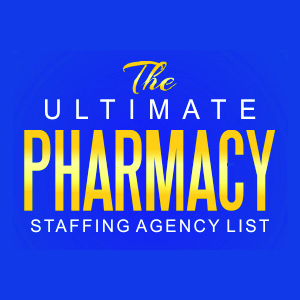 more pharmacists and technicians than I care to admit, I know that certain sections of the pharmacy strike terror into the heart of many young, eager professionals. One such section is the “diltiazem” shelf (or shelves!). There are so many different strengths and forms…how are you supposed to know which one to pick when filling a new prescription? Can any of them be interchanged? This post is the 3rd in the series on commonly confused medications in the retail pharmacy. Post #1: Confused by Divalproex DR vs. ER? Post #2: Confused by Bupropion strengths? 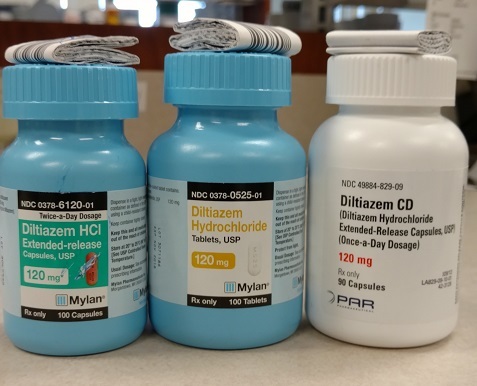 As with previous posts, understanding all the diltiazem generic products begins with looking at the brand name counterparts. But this is where it gets a bit more challenging. There are a wide variety of brand-name products for which generic diltiazem is the equivalent. This is exclusively with the ONCE DAILY formulations. But we will talk our way through the mess and shortly this section won’t scare you anymore. Diltiazem, by the way (for any non-pharmacy readers) is what is called a “calcium channel blocker” and used to treat things like high blood pressure and angina. 1) How many times per day is it taken? 2) Is it a tablet or capsule? 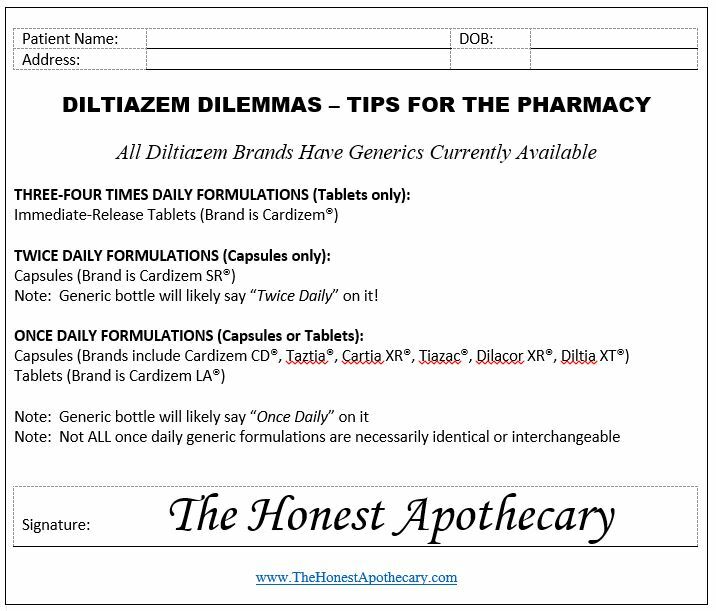 Therefore, the easiest way to organize and understand your diltiazem section is to look at the products in terms of how many times per day they should be taken, and then (when necessary) divided between tablets and capsules. Tablets Only: Diltiazem tablets (generic of the original Cardizem tablets) are taken 3 OR 4 times daily. Diltiazem tablets come in 30mg, 60mg, 90mg and 120mg strengths. They will NOT say “time released” or “delayed release” or “sustained release” or “long acting” or any such language. This formulation ONLY comes in tablets. Note: These tablets dissolve pretty quickly with a peak blood level obtained in about 2-3 hours and have a half-life of about 3-4 hours. Thus they have to be taken 3 OR 4 times daily to maintain therapeutic blood levels. Hint: If the prescription says to take the diltiazem 3 OR 4 times daily the prescriber is almost certainly referring to these immediate release tablets. Capsules Only: Diltiazem sustained-release capsules (generic of the original Cardizem SR) are taken twice daily. Diltiazem SR capsules come in 60mg, 90mg and 120mg strengths. The generic bottle will likely say “twice daily” to help identify this formulation. Note: Since the availability of once daily formulations, the twice-daily version would be rarely used any longer. I think the brand has been discontinued, but generics still remain. Hint: If the prescription indicates the dosage is twice daily the prescriber is likely referring to these sustained-release capsules. Tablets or Capsule formulations are available. This is the section that could be tricky depending on your state substitution laws. Each formulation has their own set of “equivalent” generics. However all of them are likely to be therapeutically equivalent. A. Once Daily Capsule Formulations: The generic once daily capsules are the equivalent of several different brand name products. It is these once-daily capsule formulations that come in the most variety of strengths. Below I will list most of the brands and strengths available. This list may not be comprehensive. Note: ALL have generics available. Note: While all the above brands are available generically and are taken once daily, they are not necessarily interchangeable. For example, Dilacor XR capsules have a unique dosage formulation in that the capsule contains 4 small tablets (go ahead, open one and see!). As another example, the Tiazac package insert mentions that the capsule can be opened and the contents sprinkled on cool food and swallowed (not chewed). B. Once Daily Tablet Formulations: The generic once daily tablets are all the equivalent of one brand, Cardizem LA. Note: Why would the makers of Cardizem CD (once daily) come out with a new version called Cardizem LA (also once daily)? Redundant? Yes. The CD version was a capsule and the LA version is a tablet. So what? Well…the patent was expiring on the capsule formulation and many manufacturers use strategies like this to maintain some patients on a brand-only version. Also, there are some kinetic differences in the release and peak blood-level obtained, but nothing that is really clinically significant. ADVICE FOR PRESCRIBERS: Help avoid the confusion by writing your order using a BRAND NAME and DOSAGE FORM (i.e. tablet or capsule) and allow for substitution. Thus, if you want to prescribe a ONCE daily formulation, please just pick a brand above (for example, Cardizem CD capsule) and write the prescription that way. 1) Organize your diltiazem section by how many times per day that formulation is usually dosed. Mark the shelves CLEARLY as either |ONCE|; |TWICE|; or |THREE OR FOUR| times daily formulations. I recommend putting some sort of note in this section to ALERT the staff to be careful. 2) Be careful when filling a diltiazem prescription that you are matching the dosing frequency on the order to the correct formulation. 4) Understand that not all once-daily formulations have truly identical release properties and some may have different dosage directions (e.g. Dilacor XR is recommended to be taken in the morning on an EMPTY stomach). One Response to Diltiazem Dilemmas – Why So Many Diltiazems? This is very interesting, thanks for sharing. The generics can get so confusing – do you think this contributes to adverse drug reactions? We’d love to hear more about your ideas on ways that we can improve drug safety at the Sternfels Prize!